An administrator's deed is a statutory form under RIGL 34-11-12 for sales of real property from a probated estate. An administrator is a court-appointed fiduciary entrusted to administer a decedent's estate. He or she is the personal representative selected by the probate court when the decedent dies without a will, or the executor named in the will is unwilling or unable to serve. Use an administrator's deed to transfer title to a purchaser with implied fiduciary covenants. Administrator's deeds contain covenants that the grantor is the duly qualified and acting administrator of the estate, that he or she has good right and lawful authority to convey the decedent's interest in the subject property, and that he or she, in his or her capacity, has given bond as required by law and has complied in all respects with the court's decree. In Rhode Island, the probate court must authorize sales of realty from the estate (RIGL 33-19-3). Prior to the sale, the administrator files a petition for the sale of real estate with the court, which must include the reason for the sale. Valid reasons for petitioning for the sale of real property under RIGL 33-12-6 include enabling the payment of debts or facilitating efficient administration of the estate. This authority excludes sales of real property that is specifically devised by the decedent's will, unless the devisee(s) give consent to the sale (RIGL 33-12-6). 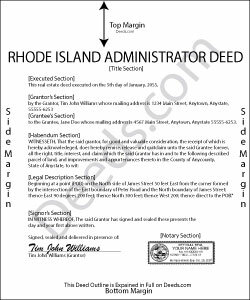 In addition to meeting the standard requirements for form and content of deeds in Rhode Island, the administrator's deed should reflect the true consideration paid by the grantee for the grantor's interest in the realty. Rhode Island levies a real estate conveyance tax based on purchase price, to be paid by the grantor, due upon recording (RIGL 44-25-1). Submit a conveyance tax return (CVYT-1) to the Rhode Island Division of Taxation. Nonresident sellers of realty in Rhode Island must furnish a residency affidavit to the buyer at closing. The grantee deducts and withholds a percentage of the consideration paid to nonresident sellers (for more information on withholding of Rhode Island tax, see RIGL 44-30-71.3). Grantees may rely on the grantor's residency only if the grantor provides a residency affidavit . If the transfer is exempt from the affidavit requirement, the deed should include a statement to the effect that the grantor is a resident, and that no withholding under RIGL 44-30-71.3 is required. The administrator must sign the deed in the presence of a notary public for a valid transfer. Recording in Rhode Island is done at the municipal level in the town or city where the property is situated. Submit the completed, signed, and notarized deed, along with any supplemental documents, to the land evidence division of the town clerk in the municipality where the subject parcel is located. The information provided here is not a substitute for legal advice. Consult an attorney licensed in the State of Rhode Island with questions regarding administrator's deeds, or for any other issues related to settling an estate, as each situation is unique.